Principality of southeastern Europe, under the suzerainty of Turkey. According to Josephus ("Ant." xxii.) and Belloguet ("Les Cimérieux," p. 24) the Jews knew of Mœsia (old name for the Balkan peninsula) at a very early age. But the first Jewish community of Bulgaria was founded at Nicopolis under Trajan, after the victories gained over the Dacians. The Bulgarian czar Krum brought some Jews among the 30,000 prisoners carried away from Thessaly in 811. A large number of Byzantine Jews established themselves in Bulgaria in 967, at Nicopolis, Widdin, Silistria, and Sofia (compare Solomon Abraham Cohen,Responsa, Leghorn, 1592). The rabbinical authors called them Romanim Jews. They preserved their Greek customs, one of these being to choose a chief rabbi from without their own city, and another to close their shops on the day of a burial; this latter custom having been observed until the year 1720 ("Mayim Rabbim," Amsterdam, 1637). In 1189 the two brothers Assen and Peter founded the Bulgarian kingdom, this being the second foundation. They entered into relations with Venice, Ragusa, and Geneva. As the majority of the merchants in these cities were Jews, offices were established by them (according to Ubicini, "Provinces Danubiennes")in the ports of Bulgaria on the Danube, especially at Widdin. Under the czar Assen II. (1218-41), the successor of Assen I., the number of Jews increased. The pope in a letter to Bela IV., king of Hungary (1238), complains that the above-mentioned czar received heretics into his dominions (Gh. Sincat, "Cronica Romanilou," p. 262, Jassy, 1853). The Tatars invaded Bulgaria about 1290, under their chief, Khan Tchoca, who was killed by a Jew at the siege of Tirnova. Muralt (ii. 402) places this event in 1293, other historians, as Hammer-Purgstall ("Goldene Horde"), in 1299. An anonymous work, printed by R. Jonah of Constantinople in 1743, mentions the communities at Philippopolis (1344), at Zagora (1344), and at Nicopolis and Silistria (1377), as existing at the time when Bulgaria fell into the hands of the Turks. When Czar Ivan Alexander came to the throne, in 1330, he was a widower, and father of two children, Michel-Assen and Dobritch. The following year he married his second wife, the daughter of a woyewode, by whom he had one son, Ivan Strachenir. After a time he repudiated this wife, and married in 1335 a beautiful Jewess of Tirnova, Sara by name, who was converted to Christianity (Jirecek, "Gesch. der Bulgaren," p. 312, Prague, 1876). The new czarina received the name of Theodora or "Newly Enlightened Czarina and Sole Support of all the Bulgarians and Greeks." Gifted with a remarkable intelligence, according to the historians, she aided the czar in all affairs of state. But when Ivan Alexander grew old, Theodora, wishing to secure the future of her children, Ivan Chichman and Tamar (or Mara or Marie), divided the kingdom in 1355, Ivan Chichman receiving one part, with Tirnova as the capital, Dobritch receiving the Dobroudja, and Strachenir the province of Bdin or Widdin. Thus Theodora, moved by maternal sentiment, made the mistake of enfeebling the land by dividing it. Ivan Chichman, the son of the Jewess, succeeded his father in 1346, and in 1367 he hospitably received the Jews who had been driven from Hungary and had settled at Nicopolis, Plevna, and Widdin. Mention is made of R. Shalom of Neustadt, who settled at Widdin. The community of Sofia, formerly called Stredetz, and founded by Byzantine Jews at the end of the tenth century, erected a synagogue, which is still known under the name "Kahal de los Gregos." Ashkenazic Jews established themselves at Sofia in 1360. The Bulgarian Jews were then divided into the following four rituals: (1) Bulgarian Jews properly so called; (2) Italian Jews from Venice; (3) Roman or Byzantine Jews; and (4) Ashkenazim, of German origin. It appears that after the death of Ivan Chichman a reaction was felt against the Jews of Tirnova, which led to their emigration to Nicopolis. The Spanish Jews who arrived in that city in 1492 found there a Jewish community, having at its head Ḥayyim b. Albalgui or Albalgri (the Bulgarian). Among the immigrants were Ephraim Caro and his son Joseph, from Toledo; the latter married the daughter of this rabbi, and later became famous by his work, the Shulḥan 'Aruk. Widdin is also an ancient settlement, judging from a manuscript of the beginning of the fifteenth century, entitled "Perush we-Tosafot," by R. Dossa b. Moses of Widdin. Bazarjik, or Tatar Bazarjik, received its first Jewish settlement about 1500, with the arrival of some Spanish refugees, Aobi being its first rabbi. Under Turkish rule the Jews of Bulgaria were little known; all Jewish life seems to have centered in the communities of Constantinople, Salonica, Smyrna, and Adrianople. All that is known is that from time to time they were severely oppressed by rapacious Turkish officials as well as by the Greeks. During the next three centuries and a half (1500-1876) the only distinguished Jewish name is that of Joseph Caro. It was not until the Russo-Turkish war of 1877-78 that the Jews of Bulgaria came into notice. Goaded by the insolence of the peasantry who were in rebellion against the sultan, they did not know whether to favor the movement for the emancipation of Bulgaria or to remain faithful to the Turks. Their hesitation cost them much suffering. As soon as the Russian forces appeared before a town, the Bulgarians would denounce the Jews as hostile, and would set about to punish them. They were expelled in a body from Kezanlik, Zagora, Widdin, Shipka, and elsewhere, plundered of all their property, and forced to take to the road under miserable conditions. Their sufferings aroused a cry of horror throughout Europe, reaching even to America (see "Bulletins" of the Alliance Israélite Universelle); thousands took refuge in Constantinople, where their needs were looked after through the munificence of Baron Maurice de Hirsch. Upon the close of the war the Jews of Bulgaria enjoyed comparative repose for the space of fourteen years (1878-92). In 1877, when the Turks set fire to the city of Sofia, it was the Jews and Jewesses, according to Bianconi ("Carte Commerciale de la Bulgarie," p. 12, published by Chaix, Paris), who fought the flames, and, armed with whatever weapon came to hand, beat off the soldiers employed in setting fire to the buildings. 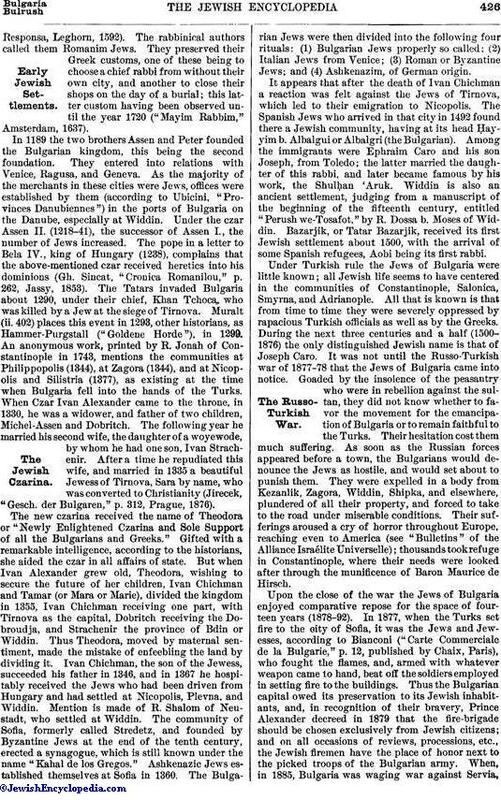 Thus the Bulgarian capital owed its preservation to its Jewish inhabitants, and, in recognition of their bravery, Prince Alexander decreed in 1879 that the fire-brigade should be chosen exclusively from Jewish citizens; and on all occasions of reviews, processions, etc., the Jewish firemen have the place of honor next to the picked troops of the Bulgarian army. When, in 1885, Bulgaria was waging war against Servia,the Bulgarian Jews distinguished themselves so highly in the battles of Pirot and Slivnitza that Prince Alexander publicly thanked them, calling them "true descendants of the ancient Maccabees." The Bulgarian constitution accords all civil rights to Jews, in obedience to the Treaty of Berlin (1878). They are electors, are eligible to office, and are to be represented in every municipality by one or two members. They may become members of the Sobranje (Chamber of Deputies). They are subject to military service and have the right of military promotion. Each Jewish community is governed by its "synagogal committee," which levies a tax upon each individual. From this revenue, together with the voluntary offerings of the faithful, the committee, whose members serve three years and are officially recognized by the prince, provide for all the communal expenses as well as for the maintenance of Jewish schools. The liberality of the new constitution was at once received with enthusiasm by the Jews. Three graduates of the military school of Sofia attained the rank of major. They are Mochonoff Garté of Philippopolis, Moréno Graziani of Shumla, and Behdjet, or Behdjetoff, of Rustchuk; the last has recently resigned his commission. Since 1890, however, anti-Semitism has made its appearance in Bulgaria, so that both elementary and high schools have become almost closed to Jews by reason of the hostility of the Christian students. M. Gabbé, a certain large landed proprietor, was elected to the Chamber of Deputies, whereupon his Christian colleagues made their utmost endeavors to invalidate the election because of his Jewish race. An accusation of murder for ritual purposes was made against the Jews of Wratza in 1891, but the jurist Stoïloff (later minister), proved their innocence ("Bulletins" of the Alliance Israélite Universelle). Anti-Semitism has developed to such an extent in Bulgaria that the Jews are now emigrating in large numbers to Turkey in Asia. The Jews of Bulgaria have not contributed to the national literature; they have written nothing in the Bulgarian language up to the present time (1902). They have four journals: one, which might be called peripatetic, "El Amigo del Pueblo," is published alternately at Sofia and at Rustchuk; the others are: "El Eko Judaico," "La Verdad," and "Ha-Shofar." A Judæo-Spanish journal, "El Dia," was published at Philippopolis in 1897, and a Judæo-Spanish review, "La Alborada," at Rustchuk in the same year. 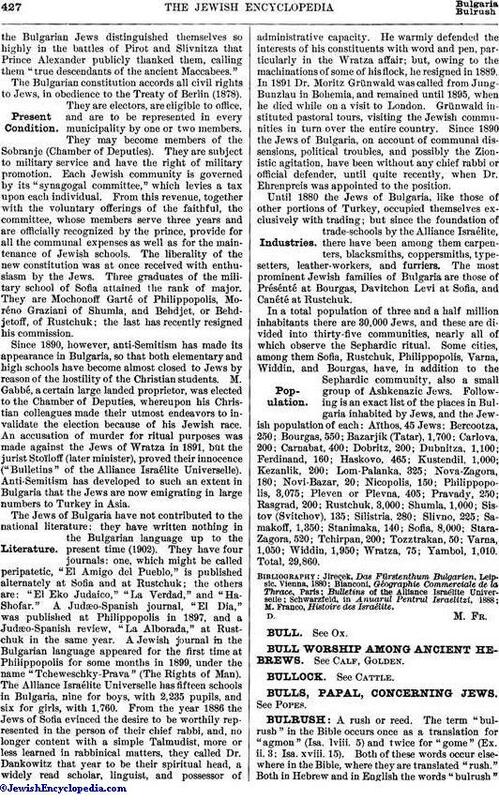 A Jewish journal in the Bulgarian language appeared for the first time at Philippopolis for some months in 1899, under the name "Tcheweschky-Prava" (The Rights of Man). The Alliance Israélite Universelle has fifteen schools in Bulgaria, nine for boys, with 2,235 pupils, and six for girls, with 1,760. 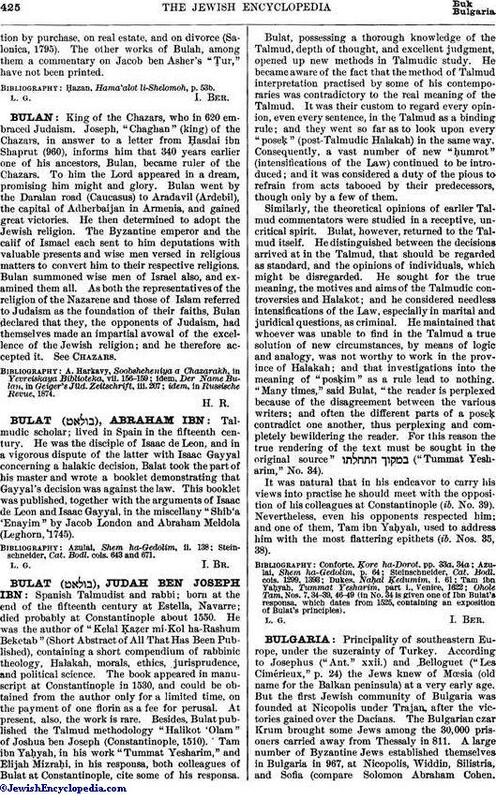 From the year 1886 the Jews of Sofia evinced the desire to be worthily represented in the person of their chief rabbi, and, no longer content with a simple Talmudist, more or less learned in rabbinical matters, they called Dr. Dankowitz that year to be their spiritual head, a widely read scholar, linguist, and possessor of administrative capacity. He warmly defended the interests of his constituents with word and pen, particularly in the Wratza affair; but, owing to the machinations of some of his flock, he resigned in 1889. In 1891 Dr. Moritz Grünwald was called from Jung-Bunzlau in Bohemia, and remained until 1895, when he died while on a visit to London. Grünwald instituted pastoral tours, visiting the Jewish communities in turn over the entire country. Since 1890 the Jews of Bulgaria, on account of communal dissensions, political troubles, and possibly the Zionistic agitation, have been without any chief rabbi or official defender, until quite recently, when Dr. Ehrenpreis was appointed to the position. Until 1880 the Jews of Bulgaria, like those of other portions of Turkey, occupied themselves exclusively with trading; but since the foundation of trade-schools by the Alliance Israélite, there have been among them carpenters, blacksmiths, coppersmiths, type-setters, leather-workers, and furriers. The most prominent Jewish families of Bulgaria are those of Présénté at Bourgas, Davitchon Levi at Sofia, and Canété at Rustchuk. In a total population of three and a half million inhabitants there are 30,000 Jews, and these are divided into thirty-five communities, nearly all of which observe the Sephardic ritual. Some cities, among them Sofia, Rustchuk, Philippopolis, Varna, Widdin, and Bourgas, have, in addition to the Sephardic community, also a small group of Ashkenazic Jews. Following is an exact list of the places in Bulgaria inhabited by Jews, and the Jewish population of each: Aïthos, 45 Jews; Bercootza, 250; Bourgas, 550; Bazarjik (Tatar), 1,700; Carlova, 200, Carnabat, 400; Dobritz, 200; Dubnitza, 1,100; Ferdinand, 160; Haskovo, 465; Kustendil, 1,000; Kezanlik, 200; Lom-Palanka, 325; Nova-Zagora, 180; Novi-Bazar, 20; Nicopolis, 150; Philippopolis, 3,075; Pleven or Plevna, 405; Pravady, 250; Rasgrad, 200; Rustchuk, 3,000; Shumla, 1,000; Sistov (Svitchov), 135; Silistria, 280; Slivno, 225; Samakoff, 1,350; Stanimaka, 140; Sofia, 8,000; Stara-Zagora, 520; Tchirpan, 200; Tozztrakan, 50; Varna, 1,050; Widdin, 1,950; Wratza, 75; Yambol, 1,010. Total, 29,860. M. Franco, Histoire des Israélite.